I had dinner a little early today. The soon-to-be-ex Mrs. K and I are working to get our house put up for sale, so I'm headed over there soon to help out (or get in the way ) where I can. A friend gave me some homemade sauerkraut over the weekend. It's some of the best I've had, including my own homemade kraut. He puts dill seed in it, and claims that finely shredding the cabbage makes for a much milder flavor. I don't know about that, but he's got something working for him there. I paired it with a couple of Wisconsin artisan smoked sausages. Oh no, I'm sorry. Divorce is no fun, SK. Hang in there. We've got bratwursts with cheese stuffed in them, wrapped in bacon and put under the broiler until the bacon's crisp and the cheese is melty. Artichokes are again in the mix. Steamed whole, with leaves dipped in drawn butter, salt and pepper. Then there's seasoned green beans, and cantaloupe and some leftover ice cream for dessert. ****Burrrrrrrpppp. **** I hope I can move after dinner to get to the TV remote. I tossed a small piece of boneless pork loin into the slow cooker, along with onions, kraut, and white wine (we're too low on beer to use some for cooking). Seasoned with caraway seed, brown mustard seeds, and a few bay leaves. I'll serve it with mashed potatoes and braised red cabbage. Might crack open the jar of Amish pickled beets we picked up in PA. And I have two tired apples I'll turn into chunky sauce. Yummy pic, Steve! We have some leftover mushroom chicken to work on, along with leftover cooked cabbage. I need to foray into the homemade sauerkraut realm. That sounds so good I wonder how it would do in the Instant Pot. DH is out teaching a class tonight and I have a Master Gardener meeting where we're having a pizza party. He'll have to scrounge for leftovers when he gets home. 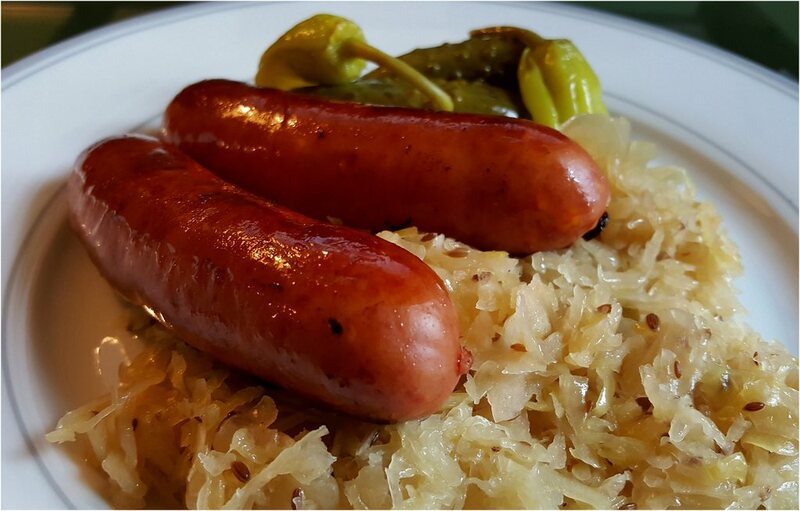 We are having brats simmered in beer and onion along with sauerkraut. I already did this part and they are just lollygagging until dinner time. Will finish on the grill. Frozen green beans with Bacon on the side. A chicken thigh with a side of broccoli and a salad. Oh my, Steve...that looks delish! As always, I'm inspired by the dinners posted. I'm roasting a couple of chicken thighs, seasoned with Penzey's roasted garlic and onion powder. While those are resting and while the oven's on, I'm going to roast some sweet potato 'fries' and since it's a Penzey's kind of day, I'm going to try seasoning them with smoked paprika and cumin. Sliced avocado on the side.